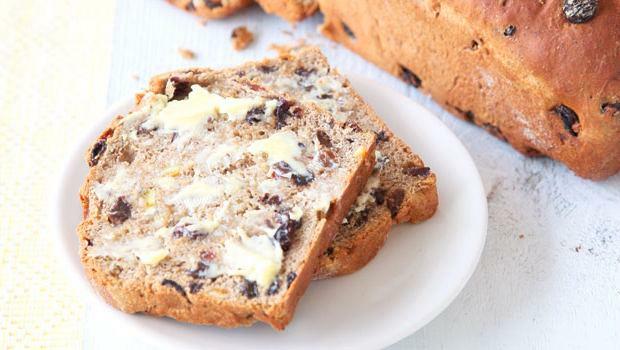 Barmbrack is a traditional Irish sweetened bread. In Gaelic it’s known as báirín breac, or “speckled loaf” due to the way it is dotted with raisins. The tradition was to add to the cake mixture a pea, a stick, a piece of cloth, a coin, and a ring. Each item had a special significance for the person who discovered it in their slice of cake. The person who received the pea wouldn’t marry that year; the stick meant an unhappy marriage; the cloth indicated poverty and the coin riches; while the person who found the ring would wed within the year. Nowadays it’s usually just a ring that’s added to the batter, which is a good thing as it does seem unfair to give people food that could bring them such bad luck! 1. Place the mixed dried fruit in a bowl and pour over the whiskey and cold tea. Allow to soak up the liquid overnight. 2. Preheat the oven to 170°C (325°F/Gas 3). Grease and line a 900g (2lb) loaf tin. 3. Combine the flour, baking powder, sugar and mixed spice in a mixing bowl. Make a well and break in the egg, then use a wooden spoon to mix it with the dry ingredients. Add a little bit of the liquid from the mixed fruit and mix it through. You may not need all the liquid, though you are looking for a wet dough. 4. Stir in the mixed fruit until everything is thoroughly combined. Add the ring and stir through. Spoon the wet dough into the lined loaf tin, place on the middle shelf in the oven and bake for 1 hour. 5. Remove from the oven and allow to cool slightly before removing from the loaf tin and placing on wire rack. Cover in cling film and foil and allow to sit for 1–2 days before cutting into it. Serve in slices, spread with a little butter and accompanied by a good cuppa! This entry was posted in Baked Goods, Cake, Halloween. Bookmark the permalink.